Vlog ~ Flux is now an official part of Fluxview.com Please update your bookmarks. If your were subscribed to this Vlog your RSS feed should transfer to the new site automatically. please be certain to ignore all the new fancy gadgets. Apparently their screening something of mine it's on the poster. 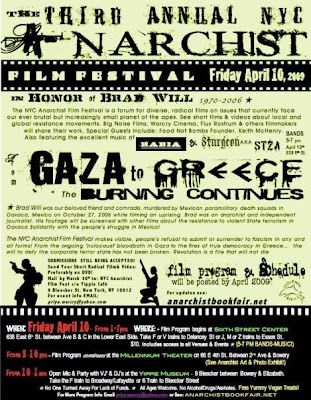 The Third Annual NYC Anarchist Film Festival in Honor of our murdered comrade and colleague Brad Will takes place Friday April 10, 2009 in the lower east side. See attached flier for locations and event times. As a prelude to the Third Annual NYC Anarchist Bookfair from April 11-12, The Third Annual NYC Anarchist Film Festival will showcase contemporary documentaries and videos on current events and social movements from Palestinian resistance in Gaza to the popular uprising and recent riots that swept Greece like wildfire.